Get the funky side up with this outstanding designer creation called Kitschy Pinky Georgette Tunic for Women by Snehal Creations. This scoop neck short tunic is made from Ply. Crepe fabric. 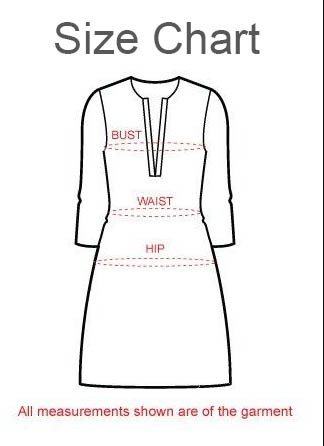 The neck of the tunic carries a designer multicolored embroidery design around it. The tunic is round edged at the chalks and comes taped in sky-blue and black including the sleeve edges. This one shoots your fashion quotient by fits and starts.